The General Synod of the Church of Ireland is meeting in Limerick for three days later this week, from Thursday 4 May to Saturday 6 May. In the past, I have attended the General Synod in Armagh, Belfast, Cork, Dublin, Galway and Kilkenny, but this is the first time for it to meet in Limerick – and this in the year that I have moved to the Diocese of Limerick, Killaloe and Ardfert, as Priest-in-Charge of the Rathkeale and Kilnaughtin Group of Parishes and Precentor of the cathedrals in the diocese, including Saint Mary’s Cathedral, Limerick. The General Synod opens with a celebration of the Eucharist in Saint Mary’s Cathedral, Limerick, at 10 a.m. on Thursday, and the main meetings are taking place in South Court Hotel. Since I moved to Co Limerick in January, I have enjoyed exploring the mediaeval and Georgian streets of Limerick, learning about its history, heritage and architecture. This week, between today and Saturday, I thought it would be interesting to introduce readers to some of these buildings in Limerick. 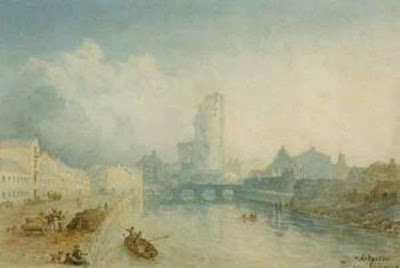 I have written about Saint Mary’s Cathedral and other Limerick churches and buildings in the past. So this week I am looking at five buildings that are no more than five minutes’ walking distance from the cathedral. My first choice is the County Courthouse on Merchants’ Quay, which faces the west door of Saint Mary’s Cathedral. The courthouse is located on Merchants’ Quay overlooking the River Shannon from the north-east. The site ends at the river’s edge with a limestone block-faced quay wall. This building was recently renovated redeveloped by Murray O’Laoire Architects, when much work was carried out on the interior and the exterior restored. While the exterior of the building retains much of its original form, the interior had been extensively remodelled in 1957 and any surviving historic details were lost at that time. Like many provincial courthouses in Ireland, this a handsome building in the classical style. However, it is a less imposing building than many of its contemporaries because it is not elevated over a basement and because it is stands on a flat site. The exterior is characterised by its finish of dark stone and rendered areas, giving it a distinctive appearance. The foundation stone was laid on 1 September 1807, and the building was still not completed when it was opened in 1809. The portico was completed by July 1814. The courthouse was designed by Nicholas and William Hannan, who were provincial architects associated with Limerick, and financed by the Grand Jury. The alterations were designed and carried out by Nicholas Hannan in 1814. The builder brothers Nicholas and William Hannan were active in Limerick, active in the first three decades of the 19th century. They also worked on the courthouse at Bruff, Co Limerick, Limerick County Gaol and Limerick City Gaol. James Pain, the great Limerick-based architect, and his brother George Richard Pain, carried out the furnishing of the barristers’ room and other proposed alterations in 1820. The building cost £13,000 and the portico cost a further £700. This is a detached, quadrangular, five-bay, two-storey rendered courthouse with giant Doric pilasters. It was built in 1809 and the limestone ashlar tetrastyle Tuscan portico to the north-east facing front elevation was added in 1817. This is an historically important structure in its own right and because of its location. When it was built, it marked the demise of the old port as anything other than a place for small boats to unload. But it also brought the county courthouse into the heart of the city – the earlier courthouse stood on the site a ruined abbey outside the city walls. Its location is further enhanced by its close proximity to Saint Mary’s Cathedral. Tomorrow: Gerald Griffin Memorial Schools.